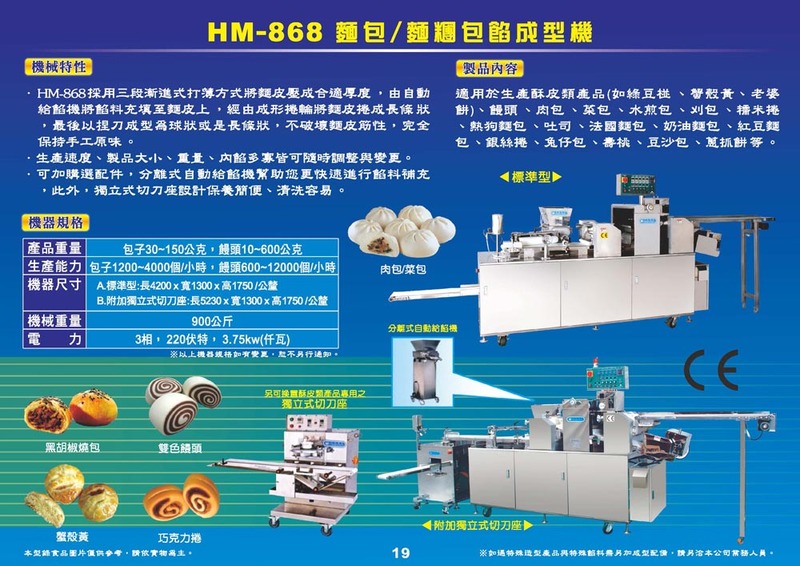 HM868 is suitable to make laminated dough products, Knish, Dinner Roll, Cinnamon Roll, Meat Sandwich, Hot Dog Bread, Meat Pie, Toast (Pan Bread), French Bread, Filling-inserted Bun, Meat Bun, Vegetables Bun, Red Bean Bun, Steamed Bun, Rabbit Bun etc. HM-868 is possible to change filling material rapidly and easily because of easy disassembly of cylinder. The dough belt will go through three rolling stages to produce the correct thickness without damaging to the gluten of dough. Following this process, the Auto Filling Feeder will place the filling on the dough belt. The dough belt with the filling on top is then rolled by the cylindrical molding section so as the dough belt forms the outer casing. The Auto Filling Feeder is an independent unit and easily attached and removed for cleaning and convenience of changing filling types. Finally the encruster automatically forms the rolled dough with inner filling into the profile of choice such as ball, long bar or pillow shape. The ratio of filling and casing is fully adjustable as is the size and length of product.